Links to other sites I have found interesting or helpful. My apologies, some of these may no longer be active, and it's been a while since I tested them. 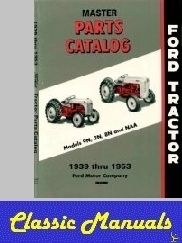 It is very easy to find reprints and even original manuals on ebay, Amazon, and on most tractor sites. The Owner's manuals and Service Manuals are very reasonably priced considering the amount of essential information they contain. Parts Books and Service Bulletins are also very nice to have. These are links to the manuals on CD that I use. My clean copies of original manuals are wrapped up and stored. 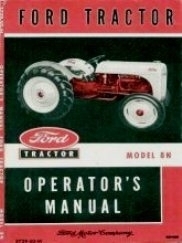 Here's another link to some digital manuals, if your tractor is a 1000 series or newer.POKE HERE. This one is just getting started, so check back and see what he has added. 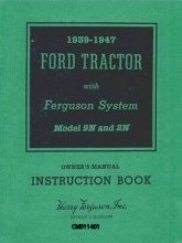 This should be your starting point for information on old Ford tractors. Search the archives and general information areas. If your answer is not there, or you can't find it, you will find a great group of tractor people in the discussion boards ready to help you. Great site for parts and information! take time to explore the many areas on this site to find an incredible amount of information. Excellent Quality N-Tractor Parts - Speedy Delivery - Restoration Information - Highest Quality Tractor Restorers. If you can't do the work yourself, and are willing to pay what it takes to do the job right, give them a call. This is a link to a web archive of John Smith's photo ID History page. I sincerely hope the priceless information that John Smith published stays archived and available somewhere on the web. The following link was suggested by a bright young man named John. He thought many of the visitors to this site might benefit from some Basic Information on Hydraulic Systems. I agree, and was happy to provide this link. If you are using a front end loader or even a front blade on your 8N tractor, Jackson Power Steering has a complete bolt-on power steering unit for your 8N. Is that cool or what? This is a great site if you are looking for Tractor parts and tractor manuals for Case IH, Caterpillar, Ford, International, Farmall, John Deere, Massey Ferguson, and other farm tractors. On-Line Parts. Looks like they have budget and restoration quality options for some parts. I have not ordered from them yet. Looks like they are centrally-located, so shipping to anywhere in the USA should be fast. Tractor Parts, Repairs, Restorations, and Support. Download the Catalog and give them a call. Tractor Parts for nearly every make and model tractor. Check the shipping cost before ordering. They also have a community forum at www.tractorjoe.com/ask . Replacement parts for Ford tractors in Winnsboro, Texas. New, Remanufactured, or Used Parts. 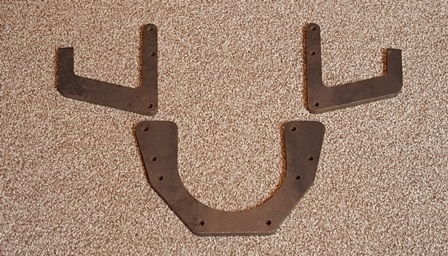 Ford Restoration and Reproduction parts. This is the largest selection and best quality parts I have found. Regardless of where you place the order, if you pay for better quality parts, the Dennis Carpenter name will probably be on the package. Download their PDF catalogs free or pay a little to get the printed copy. Marvin Baumann's 8N Website - A great website with lots of information, tractor tool kit info, incredible restorations, and custom conversions. You will even find a jet engine conversion here! This is Dan DeGroot's web site. 8N and NAA Tractor restorations. This is where I bought my new tractor tires. They arrived already mounted on new rims and ready to go for less money than I could buy tires, tubes, and pay for mounting on the old rims! The Brillman Company - Source for Vintage Wire Harnesses, Battery cables, Spark Plug Wires, Ignition, and Other Electrical Parts. The harness materials I ordered arrived quickly and were first-class. Parts Source in South-Central Pennsylvania. Redrock provides new renamufactured versions of a few of the more popular aftermarket accessories that were available for these tractors. Great deals on surplus hydraulic parts and supplies. One of my favorite stores, on-line or in-person. The most convenient way to get custom machine shop parts for any project. Pricing gets much better as quantity increases. If you can draw it, they make and ship parts to you. Design the parts on-line, click the ORDER button, and a few days later a box of parts arrives on your doorstep. Prices compare very well to quotes I've gotten from local fabricators. Laurel Auto is the engine shop that did machine work for two sleeves on my Ford Flathead V8. Talk to Greg, either one. It's a blessing to find good people, who know what they are doing. I have several of these multitools (you can't have too many). I carry one with me nearly every day. These are much more practical than the pocket knife I started carrying in 5th grade. That was waaay back in the olden days, when a kid with a pocket knife was considered normal. If you need a professional photographer in the Goochland, VA area. This is where I hang out on the web and talk tractors. Join us on the N Board where new N-Tractor owners are welcome, and there are no dumb questions. Just Because. Yes, this is way off topic, but their logo is so good they deserve a link.